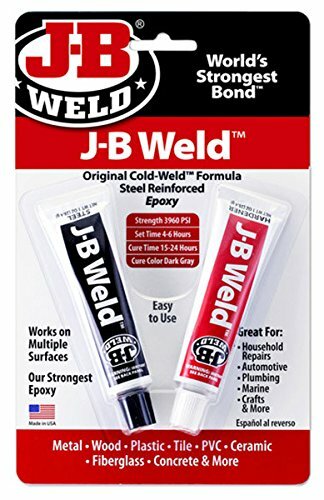 Home » Gadget » J-B Weld 8265S Original Cold-Weld Steel Reinforced Epoxy – 2 oz. J-B Weld 8265S Original Cold-Weld Steel Reinforced Epoxy – 2 oz. 2. Mix: Squeeze equal parts from each tube onto a disposable surface and mix thoroughly. 4. Dry: Sets in 4-6 hours. Cures in 15-24 hours. Allow 4-6 hours before handling and 15 hours (minimum) before putting object back in use.